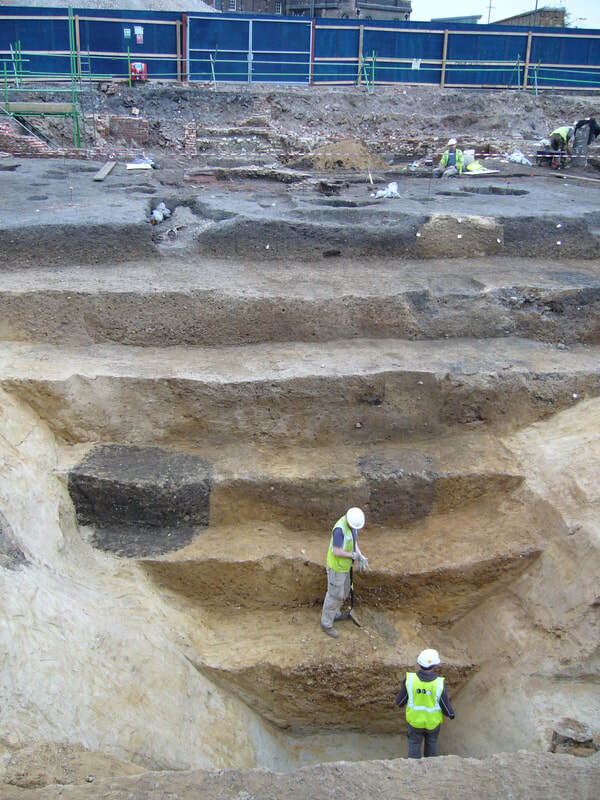 Excavations follow many of the same procedures as evaluations, but tend to be larger, and are excavated and recorded in greater detail, normally using single context planning and recording. The process of stratigraphic excavation involves the careful ‘unpicking’ of the site in the reverse order to how it accumulated, that is the most recent deposits are excavated first and the oldest last. The careful recording of these layers, the collection of all finds and the judicious collection of soils samples means, as far as is possible, for the site to be recreated as a written narrative. This procedure is usually repeated until all of the man-made layers, walls, pits or postholes have been removed from the excavation area and bare geological layers are left. It is increasingly common however for excavations to stop at the same level as or slightly below the bottom of the foundations of the proposed development: this means both that unthreatened archaeological layers are not unnecessarily destroyed, but are left in situ, and that the developer is spared any unnecessary expense. The subsequent off-site work, known as post-excavation, is often also more rigorous.